The Storyspinner has been on my TBR since before it came out, so when I finally got to download a mini haul of books onto my Kindle, it was pretty obvious that this was the first one I'd dig into. While there are some unusual aspects to this novel - both good and bad - overall this was a quite pleasant read. I'm very glad not to have been disappointed by the raves and love for this book other readers have been sharing. As soon as I started reading this book, the first thing that caught my attention after the amazing prologue was the multiple point of views. And by multiple, I mean that there were six different ones. I don't know about you, but I prefer to max out at two POV's, so when I encountered six of them, I was a bit stressed out. Not only were they a bother, but at the beginning, the only perspectives I was interested in were those of Rafael and Johanna. However, as the story progressed, I came to love the changes in POV, or at the very least, not mind them. As I grew invested in each character, and got to understand them better, each perspective change was quite pleasant, and it was nice seeing the different thoughts each character had. One aspect of the novel I never really got comfortable with was the extremely short chapters. Each chapter took only about a minute to read through - with the occasional chapter taking three to seven minutes - and I found that this made it hard for the story to move as smoothly as it could have, especially since each chapter change was a change in point of view. It didn't kill the plot by any means, but it kept the novel from being as pleasant and quick a read as it could have been. Another thing that killed me (in a good way) about The Storyspinner was how interested I was in each of the side characters, especially Pira and Leão. Each of the different characters were given a depth that I appreciated, but let's be honest, I was uniquely interested in Pira and Leao because of their opposites-attract attraction to each other. We get to know Pira as a strong, intimidating female character, so it was interesting seeing a side of her that got jealous over Leão. There's nothing I enjoy more than some adorable love. Which conveniently leads me to the romance between Johanna and Rafael. I had absolutely no problem ever with the relationship they had - in fact, it was quite cute. Unfortunately, I wasn't exactly singing/swooning/dying over Rafael after the book ended. I suppose that personally, I didn't think that he was a strong enough character. He was sweet, he had honor (and pride), he was loyal and, quite frankly, adorable, and he was a duke. Even so, we just didn't click. Again, it didn't detract from the story, but it didn't really add much in favor of it either. What did intrigue me about his and Johanna's romance was something that readers discover nearing the end of the novel. It turns their relationship into something else completely. With Johanna newly enlightened about her past and her connection to Rafael, I really hope she doesn't blindly accept everything. However, that's a conversation for the next book. But OMG that cliffhanger, what the heck. It shouldn't even be called a cliffhanger, that's how terrible it was. And I don't mean terrible as in terrible, but as in terrible. That doesn't make sense, does it? Well, let's just say that after reading the last sentence in the book, I kept flipping back and forth through the book trying to find those missing pages. And there were no missing pages. That cliffhanger was pretty much an incomplete chapter, if not incomplete sentence. That is NOT how one ends a book, series or not. But I suppose that's just my frantic, "need the next book" self talking. When I look back on the book - and I hate to say this, believe me - it just wasn't that memorable. It wasn't a unique plot by any means, but neither was there ever a dull moment. As much as I loved Johanna and Rafael, the side characters were more interesting, and unlike my favorite books, this one didn't wreck my emotions. At all. If you're looking for a light, fun, exciting read filled with adventure and several cute (and incomplete, thanks to that shocking cliffhanger) romances, then be sure to pick this one up. 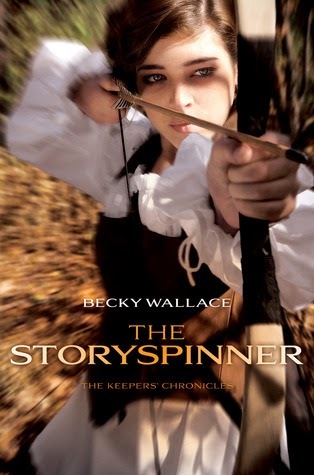 My biggest complaint is simply that The Storyspinner didn't succeed in blowing me away. Book Synopsis: Drama and danger abound in this fantasy realm where dukes play a game for the throne, magical warriors race to find the missing heir, and romance blossoms where it is least expected.